WGSI congratulates fourth-year student, Joanne Cave! Joanne has been a student in Women and Gender Studies for going on four years and this has been an exceptional year for her. 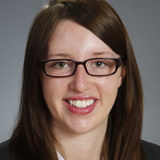 Joanne began at UofT in Woodsworth College, as a Canadian Merit Scholarship Foundation Loran Award recipient. Joanne performed in her studies impeccably, while maintaining her concerns for social justice that began in high school when she founded an organization for girls, Ophelia’s Voice, in Alberta. While a student at UofT, Joanne co-founded another organization, Connect the Sector, to connect young people in the non-profit sector to think in concert with one another about sector level issues and national and provincial policies and priorities. At UofT, Joanne has been an active participant in the WGSSU, and is currently co-president of the Union, while making Dean’s List each year. This fall Joanne was awarded the Person’s Award from the Status of Women Canada, the Peter F. Bronfman Woodsworth Gold and Leadership Scholarship, and, most recently, Joanne was awarded a Rhodes Scholarship and is off to Oxford next year! Join us in congratulating Joanne for this truly amazing year of accomplishments. We wish her all the best in her future studies and social change efforts. Read more about Joanne here.